There are NO guarantees when it comes to Internet content filtering at school or home, but it can be good to have something in place… and free is always a good price. I first learned about OpenDNS at the Apple Store, because they were using it (at the time) to block Facebook. What are your thoughts about using OpenDNS school-wide? That is, instead of the more traditional local, hardware-based proxy server filtering? I agree that for the home user, it’s a terrific solution – it’s got to be the simplest filter to configure (no hardware or software to install). As our school’s IT infrastructure evolves away from local servers, it makes me think that “cloud filtering” could make more sense too. 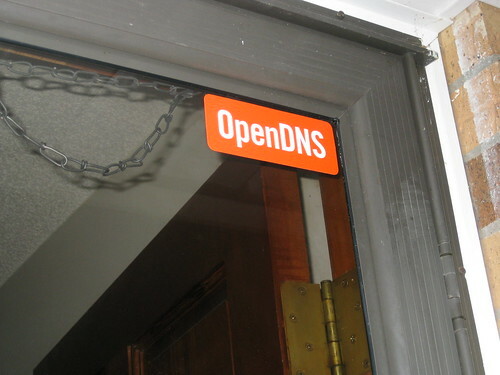 Depending on the school situation, OpenDNS could be a fantastic solution. Looking at their website and the “school solutions” as well as “CIPA Compliance” areas it’s clear some schools do go with them for filtering. For larger districts I think you want to have more data about user activity than OpenDNS will provide, my perception is that it provides some but not everything you likely want and need when you need to investigate something for the authorities. Another issue is that OpenDNS can be relatively easily bypassed by simply putting in a different DNS server into your computer, for instance Google’s DNS of 8.8.8.8. If TCP/IP settings on client machines are locked this may not be a simple process, but on BYOD devices it likely is. As saavy as students are and can be, I’m pretty confident this workaround would become common knowledge at school. So while OpenDNS would provide a CIPA compliant filtering option, it would be easily circumventable and you’d want to weigh that in your overall cost/benefit analysis. If you’re interested in pursuing this further I’d recommend contacting the OpenDNS sales folks and asking for case studies and contacts (if they’ll provide them) of customers who have and continue to use OpenDNS as an all-school filtering solution. What are your thoughts/opinions about it?